On the final day of our field trip, we headed to New York Canyon, one of the best places to see the Triassic-Jurassic boundary. We hiked up a twisting path to the top of a ridge, and then one by one began to spot fossils. On the ground. Just lying around in bits and pieces. Everywhere! These were a combination of bivalves, gastropods, and ammonites — lots of ammonites. Ammonites are commonly used for biostratigraphy, the practice of dating a particular layer by the type of ammonites it holds. They’re particularly useful for this because they were evolving so quickly that a particular shape (type of chambers, amount of ridges on the outer shell, etc.) 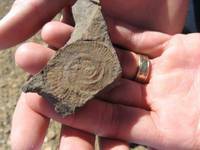 can pinpoint dates more precisely than most other fossils can. 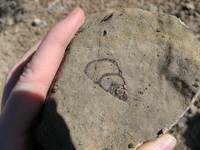 Most of the fossils were trace fossils, or imprints of an ancient organism (as shown at left). However, we did find some whole pieces that were undoubtedly the silicified remnants of actual ammonites. I found one about 1 cm in diameter. It would not be an exaggeration to say that the whole ridge we were on was littered with these things — so much so that we were making slower and slower progress up to the top and then down the other side. Our guides were urging us on to the next ridge over, so that we could look back at the actual boundary layer from enough distance to really see it, but it was awfully hard to press onward when everyone was oohing and ahhing over their latest finds. At right is a beautiful slice through a gastropod fossil (also silicified). I was struck by how almost unrealistically perfect it seemed — as if it had been drawn, not real! The sparkle effect induced by the silicification makes it even more of a Hollywood fossil. We did make it up to the other ridge, and turned around to regard the boundary layer itself. 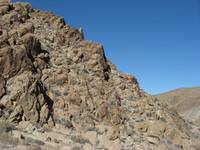 There were several holes that had been dug in and around the boundary, presumably by other researchers looking not for fossils but for evidence of a carbon isotope excursion to help pinpoint the boundary itself. As important as this is, it was somewhat less exciting than finding fossils. We never did find the smooth-shelled ammonite that is supposed to be the lowest (oldest) ammonite, appearing just after the transition to the Jurassic. An educational day nonetheless!